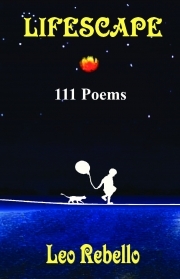 LifeScape contains 111 best spiritual poems of Dr. Leo Rebello from Bombay, India. This anthology breaks a new ground in world literature, that of 'Poesy-Novella'. As you read this slim volume, you sit on the edge of the seat and then go into deep meditation. These rich poems of oriental philosopher-poet helps one, to use his words: "to reminisce, retrace, re-vest, refresh and renew oneself". Must read for all students and teachers of literature, as also social activists, world leaders and philosophers. Those who have forgotten love will learn to love again and join in the man-making, world-uniting experiment of World Family. Unputdownable. Dr. Leo Rebello, ‘Patriot of Humanity’, is a world-renowned holistic healer and holistic development expert, author, poet, educationist and pacifist from India. This world-traveler has trained and treated over a million people in 65 countries. Founder-Patron of All India Letter-Writers Association, Fellow of the United Writers Association, Winner of Michael Madhusudan Award for Poetry, Humanitarian Poet Laureate of the World Development Parliament, he is also a World Peace Ambassador from 2004. LifeScape, which has 111 of Leo Rebello's select poems (out of over 300 written so far), and his 44th book, is soon to be followed by a unique book of 5001 Tweets by him. On Social networking sites like Facebook, Twitter, YouTube, Linked-In, Dr. Leo is popular because of his radical humanism and all encompassing world vision.